I stand at the front of the boar,flute in hands, and my Ralts standing on the railing in front of me. I begin to play the flute,a gentle, peaceful,sound escapes the flute and sounds keep adding up,making music. As I played my Ralts danced. I looked out to the ocean as I played the music from my azure flute. Ceru continues to walk in a random circle in the center of Newcome Port, the grass being bent and smushed beneath his feet, Snorunt trailing behind him idly. He had been doing this for a few minutes, distracted and thinking. He had so much energy now, just the thought of starting his journey driving him insane. He was trying to expel some of it before he left, so he would be focused and clear-headed. As I walk off to start my journey I see a boy walking around in circles. I walk up near the boy to takl to him. "Hey are you ok?" I asked as Ralts rested his chin upon my head. I see a Snorunt. "Nice Snorunt you have there." I squat down and go into my pocket to grab a poketreat and I hold it out to Snorunt. Ceru stops momentarily to stare at the random person, stunned, but then collects himself, nodding. Snorunt lets out a content noise and takes the poketreat, noming on it. "I'm fine, I'm fine. Just about to start my journey and so full of energy, you know?" Tilting his head, Ceru studies the Ralts. "Nice Ralts you have there, as well. Are you a Pokemon Trainer?" Zero adjusted the straps on his backpack and the belt where he carried his Pokeballs,he calmly smirked as he smiled down at the pokeball that carried Machop and let out a contented sigh. Zero had been waiting for this moment his entire life and finally today was the day. He may have had a late start in all of this, but finally he was beginning his journey into becoming a Pokemon Trainer all this excitement made him anxious so he decided to look around the area for other new trainers. After looking,about for a few minutes and taking a short and casual stroll he spotting two other guys around his age and approached them with a friendly smile and waved as he held out his pokeball and tossed it near them. "The short and muscled,almost human like Pokemon appeared out his Pokeball with a loud "Chop! MAAACHOP!" as it flexed it's muscled proudly before the Snorunt and Ralts,and then tried to offer them a friendly handshake." Ralts waved one arm at the Snorunt. "Yea I'm a Trainer. Name's Koga Urufu. Im from Blackthorn City in the Johto region." I stand up shortly before hearing a pokemon leaving its pokeball. I look behind me to see a Machop. "A Machop? Intresting." I think aloud. "And who might you be?" I ask the man who trains the Machop. Ceru sighs and nods- What a lucky person, already able to consider themselves a trainer. Ceru had only had Snorunt for like, what, three days? Though, they had an unnaturally close bond, if only out of necessity. Sitting down, Ceru waved Snorunt over, and he obediently climbed into his lap, watching the other two trainers and their Pokemon with interested eyes. Waving halfheartedly to the trainer with a Macop, Ceru nodded in his direction. "Why hello there. Are you a Trainer, as well?" Zero calmly nodded at the two and smiled as he glanced at the other pokemon in awe,Machop and smiled and stood proudly beside him as they both introduced themselves. "Eh,heh well not a full-fledged Pokemon Trainer I guess,I'm really only starting out today but I've had Machop here for a few months now, my name is Zero Kanzaki and I'm actually a local in these parts I guess, I grew up in Newcome Port you know. So who are you two? 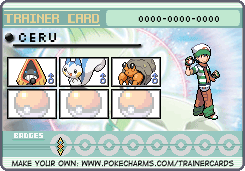 Are you out to collect Gym Badges and conquer the Pokemon League like me? It's been a dream of mine ever since I was a kid." "Nice to meet you Zero. Im Koga Urufu." I say as I hand Ralts a poketreat where it sits and happily nibbles on it. "I'm aiming for pokemon contests and to go for the Elite Four of this region." I say as Ralts finishes his little poketreat. "I have an idea. Let's all battle. A three way,free for all. Would be fun don't ya think." I say with a smile. Ceru lets out a loud laugh at Koga's bluntness. "Well, well, hold on now." Ceru says, calming down now because Snorunt had jumped at the abruptness of the laugh. "I'm Ceru Blaine, and my only goal is to travel~ I think I'll go for Gyms, and maybe do a few contests here and there." Stading up, Ceru set Snorunt on the ground in front of him. "But why not. A battle sounds fun.~"
Zero smirked as he clenched his fist and smiled at the others confidently, casually eyeing them and their pokemon momentarily,appearing slightly nervous as he noticed the Ralts that was with Koga but shook it off and nodded in agreement. "Well I'm game for a quick battle I guess,and a free-for-all would definitely be fun too,but I'm a little nervous about having to face that guy with the Psychic pokemon over there. He'd whip Machop around like a rag doll! But...whatever you say, I'm still game for a fight!" "Common Ralts let's show them what we got." I say and Ralts without hesitation jumps down to the ground. As it lands though it stumbles and falls. Ralts quickly stands up and brushes himself off and looks around at everyone. I grab my azure flute and put it to my mouth. Ceru sighs and then grins, leaning forward slightly. "Looks like I'm starting this off..." Taking a step back, Ceru flung out his arms. "Snorunt! Icy Wind on Ralts!" Snorunt looked stunned for a second at the command, but then jumped into the air, tilting it's body and opening it's mouth to fire a stream-like blast of cold wind at Koga's Ralts. Zero's face quickly turned from friendly to serious as he took a step or two back and nodded to Machop for him to do the same,his strategy was to buy a little time briefly before he came in for a finishing blow,as he watched the Ice-Type pokemon fire out a blast of cold wind towards the Ralts. Thinking up an idea Zero,then called out to Machop. "Machop back away for a momemt,and get your self pumped up and ready with Focus Energy,get yourself ready to fight!" "Machop let out a battle cry and then inhaled deeply,as it relaxed it's mind and focused it's thought,priming itself to get ready to engage the opponent." I release a note from my flute and Ralts reacts as he hears the note. Ralts disappears in a teleport and reappears behind Machop by 3 feet. Ralts begins to dance around in circles,happy he remembers the musical note. "Not nice to attack my little Ralts you know." I say with a smile,the flute only an inch away from my mouth. Ceru rolls his eyes and laughs shortly, motioning with his hands again. "Snorunt, up.~" Working with the command, Snorunt jumps into the air, higher, and evens out at a level of about ten feet off of the ground. "Now, let's try this again.~ Snorunt, Icy Wind at the Machop!" Opening it's toothy mouth wide, Snorunt let's out another blast, this time directed at Zero's Machop. "Sno-Snorunt!" Zero smirked as he nodded a few times to Machop and called out to him thinking up a quick plan to effectively dispatch Machop's main threat to him.Zero carefully watched the Ice-Type Pokemon jumping up higher as also he noticed that the Ralts had teleported behind him and grunted a little. "Machop,watch yourself! Back-flip behind Ralts and strike him with a Karate Chop to knock him towards the direction of Snorunt's attack. Now!" Machop's left forearm began to glow faintly in a light blue color,as it swiftly back-flipped in one large leap and proceeded to try and land a sharp chop against Ralt's back,intending for the impact to push Ralts forward and into the path of Icy Wind. I blew another note and Ralts strikes a low pose and sends a confusion out on Snorun to capture him and move his body so that the Icey wind would hit Machop instead of Ralts which would also disable Machop's attack as it would get blown away by the attack. "Looks like neither of them like my Ralts. It's ok Ralts. I still love you." I think to myself,knowing that Ralts would feel what I'm feeling. Ceru lets out a low grumble as Snorunt gets outlined in blue and moved, thanks to the Confusion attack. After shooting out the attack, the Confusion would wear off and Snorunt would fall to the ground, landing rather excitedly on it's feet. "D-dangit.. Snorunt, pull back for now, and be on guard." "Snorunt.." Snorunt replied, taking a few steps back and seeming to just sit there, waiting. Zero's eyes widened quite a bit as he saw the result of his failed strategy,Machop eventually ended up getting nailed with chilly blast of air that made him lose his balance and fall down onto his back,shuddering and becoming dazed for a briefly moment. "Machop,hang in there! Get back on your feet and be on guard,try to strike at Ralts again with another Karate Chop!" Machop shook itself off and got back on it's feet,grunting angrily it charged towards Ralts as it's left forearm began to glow a faint blue color,as it swung a swift chop aimming for Ralt's head. I quickly blow two notes and Ralts turns around and strikes a pose again,using confusion on Zero's Machop. As Ralts attempts to catch the Machop I blow another note and Ralts attempts to toss Machop at Snorunt with the confusion attack. I let out a smile and Ralts faces me slightly but keeps its eyes on the battle,I could feel the happiness from Ralts. Ceru smirks and waves his hand in the air, in a sort of "I'll-just-blow-it-off" motion. "Snorunt~ Protect!" In correspondence with this command, Snorunt would bend slightly and brace himself, a green sphere of energy covering his entire body. This was an attempt to block the Machop being flung at him."Snorunt!!!" Zero could only gaze in embarassment as his Machop was getting tossed about like a plain old rag doll,he panicked for a moment and tried to think up a way to get Machop out of this mess,and darted his eyes across the battlefield for a moment before nodding to his pokemon and calling out. "Machop! Brace yourself for this impact and try to smash through Snorunt's protect! Ice types are weak to Fighting moves so try to smash through him! NRight now! Karate Chop! Once more,Machop's forearm began to glow as it flew right into Snorunt,attempting to Karate Chop it with enough force to smash through the Protect. I smile as I see Zero commanding an attack onto the Snorunt. I makes four musical notes and Ralts nods and waits for Machop to finish the attack before using confusion on it. The confusion was to grab the Machop and toss it into Snorunt to try and do a double KO. Ralts runs around in circles,dnacing happily,sensing the happiness from me.